The GOLD PRICE wave, swelled, billowed, and rolled over rocks and shore, up $40.10 (3.5%) to $1,197.90. SILVER staged a little tidal wave of its own, up 65.2¢ (4.4%) to $15.416. Today’s move makes more likely the upside-down head and shoulders forecast I showed y’all on Friday, and paints the neckline about $1,200. In correcting back from the neckline, that shoulder could retrace to $1,140, $1,113, or even $1,090. If so, will scare the starch out of all but the most convinced gold investors, and offer us one last buying opportunity. 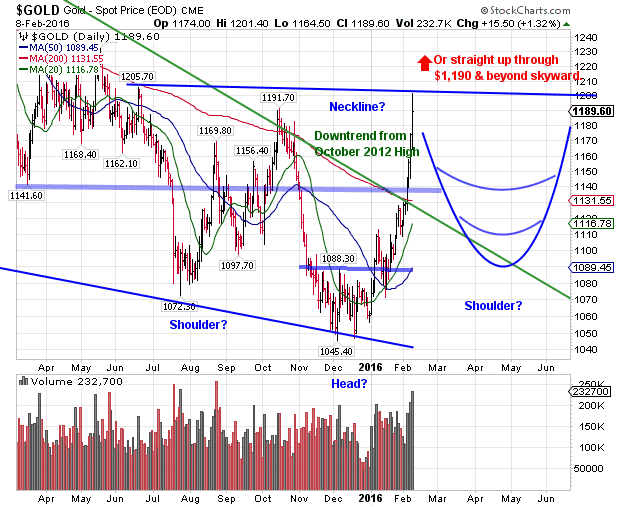 However, the gold price might make one more surge to lift that neckline. It might punch right through $1,200 and keep climbing to $1,230. Given the parabolic rise of the last few days, it will correct soon, but that rocketing volume must break first. Y’all don’t blame me if you’re missing out. I’ve been telling y’all to buy. Stocks were smashed today, and bank stocks among the worst. Got a text this morning from a friend, “Stocks down 400, gold 1189, silver 15.37.” Woke me up. Most of the day the Dow was underwater 250 or more, at its lowest, about 2:30 p.m., down at 15,803.55 (-2.5%). Yet it found friends about 2:30 who bought it till it threw a leg over the morale buster, 16,000. Closed down only 177.92 (1.1%) at 16,027.05. 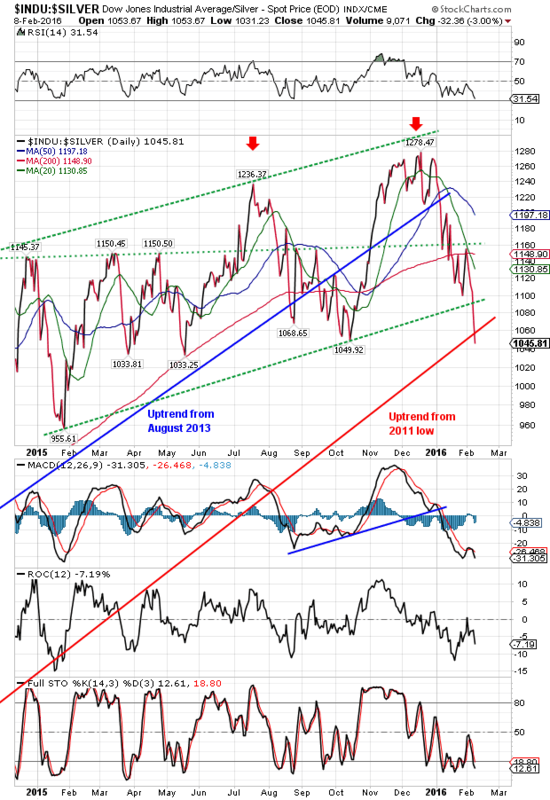 S&P500 lost 26.61 (1.42%) to 1,853.44, a portentous new low close for the move. Dow’s low close in the August crash-let was 15,666. Must hold line is 15,960. Dow is crumbling slower than the S&P500, which today posted a new low close, and a close below the August low. Shucks! Did I forget to tell y’all that volume is rising? That hints that stocks have only begun to drop. TODAY WAS THE DAY. 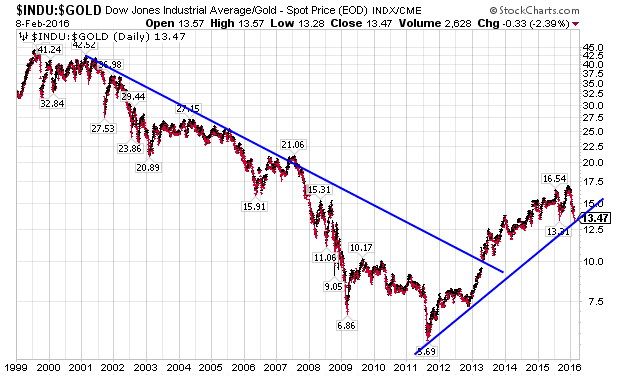 Yes, today the Dow in Gold punched through the uptrend line from the September 2011 low! DiG closed at 13.38 (G$276.59 gold dollars). The trend of Stocks against metals has again turned down, down, down. Gentleman than I am, I won’t remind y’all that from 1999’s 44 oz high to 2011’s 5.70 oz low stocks lost 87% against gold. Nor will I forecast that before gold reaches its peak that one to two ounces of gold will buy the whole Dow, another 88% loss. BEHOLD, ALSO THE DOW IN SILVER. Closed at 1,045.81 (S$1,352.16 silver dollars). Has now broken down after double tops July – December, smashed the uptrend line from August 2013, smashed the bottom channel boundary, and today punctured the uptrend from the 2011 low. Low will come at 32 oz, about 97% lower than here. Bottom rail’s on the top now. Primary trend has turned, Silver and gold prices will outrun stocks mercilessly. Sell stocks and buy metals. US dollar index sank again below its 200 day moving average (96.89), perching at 96.74, down 31 basis points (0.32%). A break of 95.50 confirms dollar is trending much further down. Euro rose 0.33% to $1.1196. Broken out into a rally above the 200 DMA. Yen surged 0.86% to 86.33, highest level since January 2015. Now at very top of range established after Abe’s gutting in 2015. Nice government men must be chewing their kimono sleeves. Stock dive has investors so scared they piled into US treasury securities, taking the 10 year treasury yield to 1.735%, lowest since 30 January 2015. Price matches that January high and from here must surge higher or fall away. No indecision allowed here. Junk bonds (See HYG) gapped down today. Bad juju. Gigantic boil in credit and banks is festering, swelling, ready to burst. I know my needle’s stuck in this groove, but please keep praying for my wife Susan and her eye. And thank you.